Pine Valley’s Makiah Snyder drives to the basket while Cassadaga Valley’s David Peterson defends Tuesday. 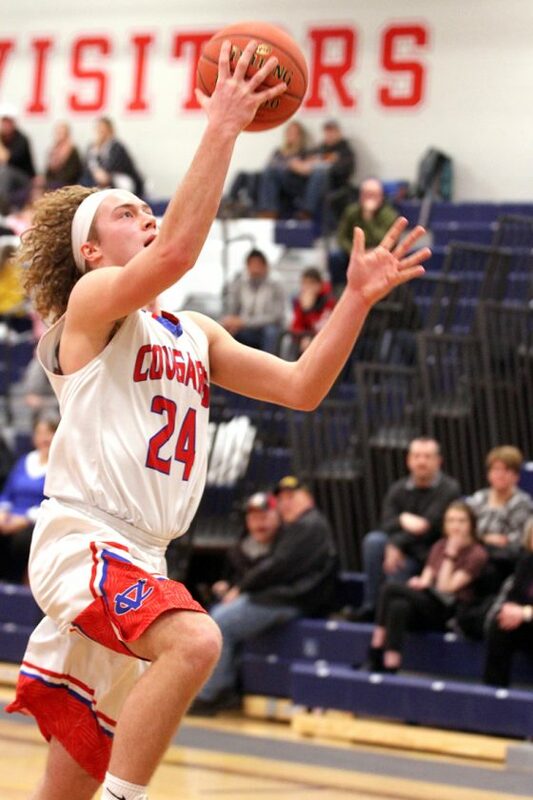 SINCLAIRVILLE — Connor Crabtree scored a game-high 32 points and Cassadaga Valley picked up a 72-56 nonleague victory over Pine Valley on Tuesday evening. Along with Crabtree, Adam Goot added 16 points; Ty Pattyson had 13 points and 11 rebounds; and Mark Swanson chipped in 11 points and six assists for the Cougars (5-7, 2-4 CCAA Division 2 West). 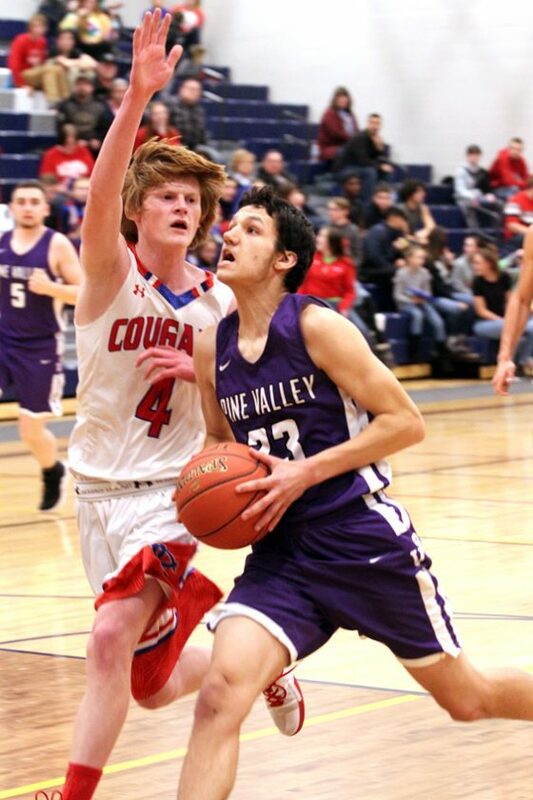 For Pine Valley (3-10, 2-5 CCAA Division 2 East), Christian Ortiz poured in 21 points and added 15 rebounds. BUFFALO — Jamestown was able to use its defense down the stretch Tuesday evening, fighting off host McKinley for a 57-55 nonleague boys basketball win. The Red Raiders (10-5, 3-4) received a big night on offense from freshman Simeon Leeper, who finished with a 22-point, 10-rebound double-double in just his second varsity game. Demarri Jones added 12 points and nine rebounds while also hitting a clutch free throw down the stretch for the visitors. Grant Moore added 6 points and eight rebounds. McKinley (8-9) was led by an 18-point night from Jahmal Lewis. Jamestown also claimed the jayvee contest, 65-56, with Jaylen Butera picking up 21 points and 15 rebounds while Calvin Ricker added 19 points. 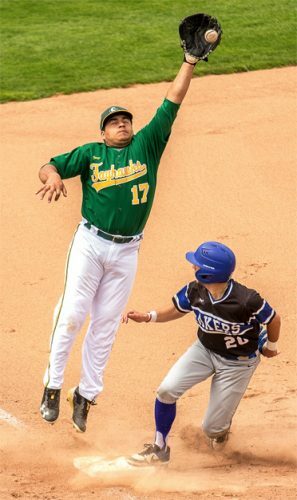 Drake 1 0 3, Rojas 2 1 5, Garland 0 0 0, Leeper 9 2 22, Moore 3 0 6, Jones 3 6 12, Crofoot 2 0 5, Freeney 2 0 4. Totals 22 9 57. Lewis 8 2 18, Elias 1 0 3, Snow 3 0 6, Lester 1 3 5, Strong 2 1 7, Austin 3 0 6, Rause 3 2 10. Totals 21 8 55. 3-point goals–Leeper, Drake, Crofoot, Rause 2, Strong 2, Elias. Jayvees: Jamestown 65, McKiney 56. PANAMA — Panama (8-5, 5-2) rolled to a 69-38 win over Portville (4-10, 1-5) in nonleague action. Cameron Barmore led the winners with a 23-point, 13-rebound double-double while Dominic Spontaneo added 11 points with seven boards. Ryan Joslyn chipped in seven rebounds and five points while Mitch Hovey grabbed 17 points and six assists after hitting five 3-pointers. Kalsman 0 0 0, Howard 1 0 2, Kloc 2 1 6, Kavanagh 0 0 0, Pullins 1 0 2, Tobola 2 0 4, Mathes 3 0 9, Griffin 1 0 3, Tarr 5 0 10, Lott 0 0 0, Nuffer 1 0 2. Totals 16 1 38. Lawson 1 0 2, Spontaneo 5 0 11, Cook 1 0 2, Sperry 3 0 7, Harper 1 0 2, Barmore 9 5 23, Hovey 6 0 17, Joslyn 1 3 5, Apthorpe 0 0 0. Totals 27 8 69. 3-point goals–Kloc, Mathis 3, Griffin, Spontaneo, Sperry, Hovey 5. FALCONER — Bobby Samuelson scored a career-high 27 points to lead Falconer to a 52-36 nonleague win over Gowanda. Samuelson scored 8 points during an 18-5 third quarter that helped the Golden Falcons (3-9, 0-7 CCAA Division 2 West)) put the game away. Drew Troutman and Nate Seaholm each had seven rebounds; Nate Abbey had six assists and four steals; and Chris Bollman added four assists for Falconer. John Ondus led Gowanda (2-12, 0-5 CCAA Division 1 East) with 12 points while Damon Macleod added 11 points and seven rebounds. Colantino 2 0 5, Ondus 4 1 12, Nagel 2 0 5, Herman 0 0 0, Kohn 0 0 0, Rosier 0 0 0, Macleod 5 0 11, Siragusa 1 1 3, Bonefede 0 0 0. Totals 14 2 36. Seaholm 3 0 6, Bollman 4 1 9, Youngberg 0 0 0, Bridges 0 0 0, Schrader 2 0 4, Samuelson 13 1 27, Micek 1 0 2, Buffone 1 0 2, Abbey 0 2 2, Troutman 0 0 0. Totals 24 4 52. 3-point goals–Colantino, Ondus 3, Nagel, Macleod. WESTFIELD — Sophomore Luke Waters had a career-high 18 points as Chautauqua Lake beat nonleague Westfield for the third time this season, 73-65. Zach Fischer led the Thunderbirds (8-5, 2-5 CCAA Division 1 West) with 20 points and Nate Adams added nine rebounds in the win. For Westfield (10-5, 6-1 CCAA Division 2 West), Ryan Jafarjian scored 16 points while Andrew Baribeau added 15 points and Evan Hauser had 13 points.